My son has a very unique talent and that is that anytime he enters a new situation, it takes him exactly 10 seconds to locate where the bird is... and believe me, wherever you go, there is always a bird somewhere. Driving down the East Coast, the gull you follow to the Chesapeake Bay Bridge and Tunnel.... Road Runner mudflaps on the back of an eighteen wheeler. A blue bird stenciled on the side of a potted plant tucked up in a window. A real mourning dove sitting on the telephone wire. Starlings picking through trash. The eagle in the USPS logo. No matter where the bird is, he will find it. Usually when we visit a thrift shop, this bird fixation means having to defend my wallet against a flock of stuffed (and usually pretty icky) birds of every variety that are just dying to come home with us. 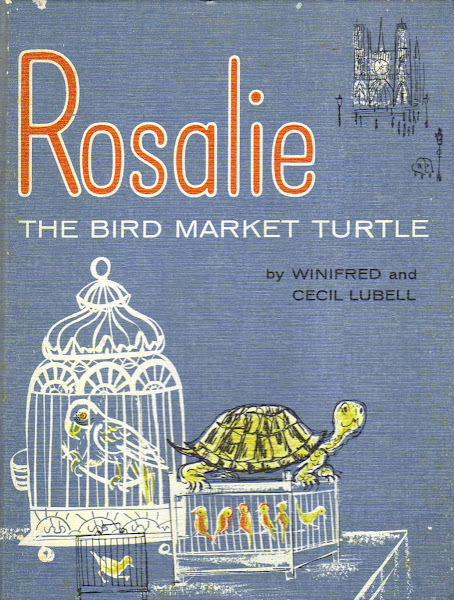 The only upside is the boy is sure to get to all the cool old vintage books starring birds before anyone else has a chance to scoop them up. 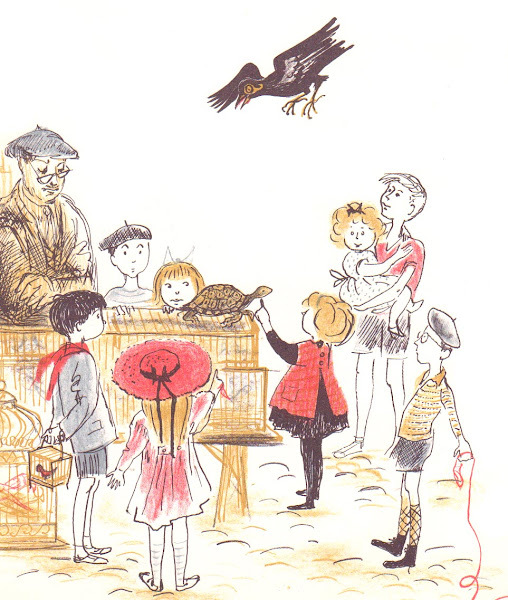 Case in point, this tale of the bird market in Paris... In the beautiful old city of Paris -- which is the capitol of France -- live Mister Boneparte and his two friends, Rosalie and Gaston. Rosalie is a turtle. She is very tame. When you stroke her under her turtle chin, she blinks her eyes and makes small gentle sounds of pleasure. Gaston is a talking bird. He is a black crow and very clever. He can speak almost as well as you and I. But he has a great, hoarse, croaking voice. 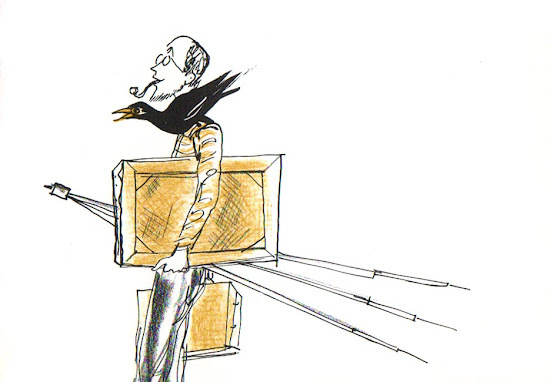 Mister Bonaparte is a bird seller. Every Sunday morning he takes his song birds, in their little wooden cages, and loads them into his bicycle truck. He puts Rosalie in her special basket. Then Gaston flies up onto his shoulder and off they ride to the big Bird Market in the center of Paris. You don't have to like birds to love this story. You don't even have to love Paris, though that helps. You do however need to have a good imagination, an admiration of friendship and a fancy for strawberries. Thanks for this. We stop by this market every so often and my girl is a big fan. Going to look around for this one to add to our ever expanding Parisian-themed-books-in-English collection. that's amazing.... sooo cool... be sure and check this one out too... very cool parisian story..